We are in the process of working on our newest Desire Line Analysis here at Copenhagenize Design Company. As mentioned in the previous post, we harvest all manner of data out of our many hours of direct observation. 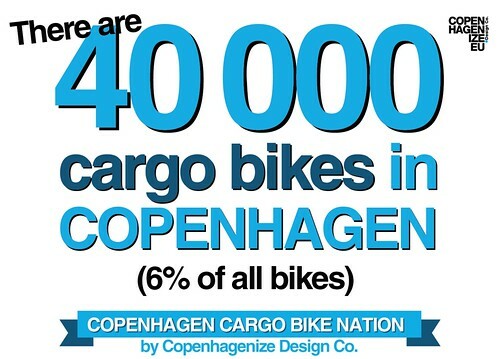 It is well known that Copenhagen is a cargo bike city. 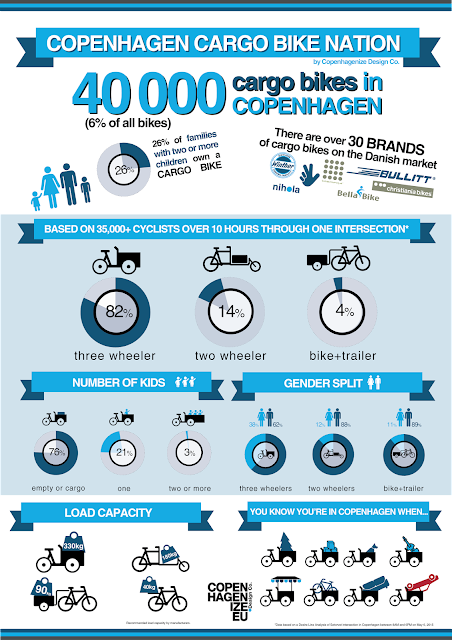 We know that there are 40,000 cargo bikes in Greater Copenhagen. 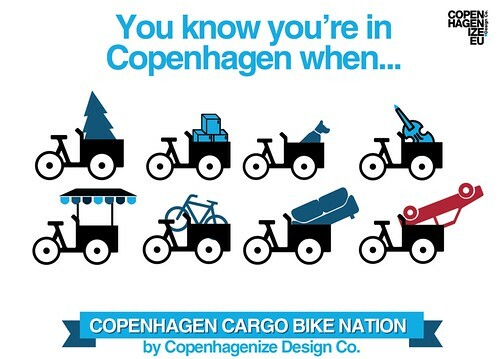 Copenhagenize moved office by cargo bike. We have this film about cargo bikes in the city for your perusal. We even have a book featuring over 700 photos of cargo bikes and how they are used. Nevertheless, we were curious and wanted some more data about cargo bikes in Copenhagen. Soo... we counted them. Over ten hours on May 6, 2015, we counted every cyclist going through the Søtorvet intersection in Copenhagen in order to study their desire lines. Then we went back and counted cargo bikes. Because we can. And because we wanted some numbers. 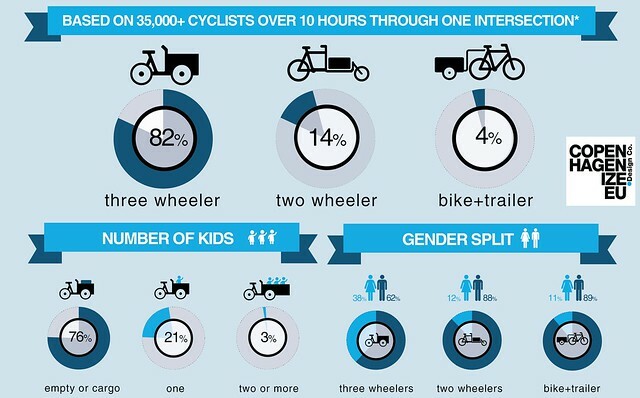 One important detail about this count is that most cargo bike traffic in the city is in the neighbourhoods. Parents dropping off their kids at school. These 'hoods are prime cargo bike territory. On the route we observed, most people are heading to work or education or running errands in the city. We knew that the number of cargo bikes would be lower than in the densely-populated neighbourhoods but we still ended up surprised. Out of over 35,000 cyclists between 8AM and 6PM, there were 718 cargo bikes. That is 2% of the total number of bicycles. In the City of Copenhagen alone, 6% of all bicycles are cargo bikes. So that number is lower, for the reason outlined above. The cargo bikes and bikes with trailers were being used for a variety of reasons. Just as a bicycle, to transport goods, to transport kids and there were also five rickshaws and 15 Post Danmark cargo bikes. We observed them all and started to record data about them and their riders. Yep. Here is the established number of cargo bikes in Greater Copenhagen. 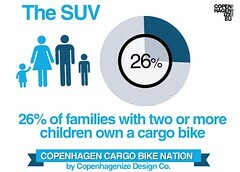 The City of Copenhagen has determined that 26% of all families in the City of Copenhagen with two or more kids own a cargo bike. 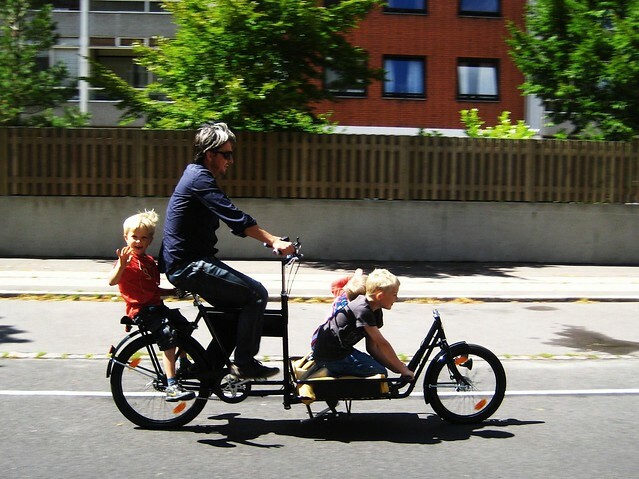 This is the primary use of cargo bikes in Copenhagen - getting kids around. The cargo bike is the SUV in this city. 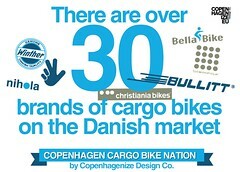 There are over 30 brands of cargo bikes available to consumers in Denmark. More than 25 of them are Danish and others are from the Netherlands and Germany. Here are the numbers we crunched based on 10 hours of direct observation at Søtorvet intersection on May 6, 2015. 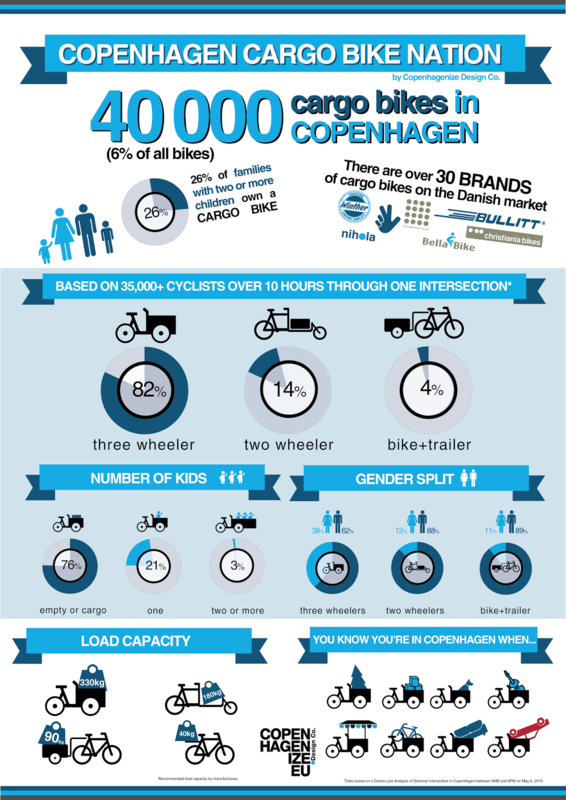 The majority of cargo bikes are the Copenhagen standard - three wheelers in a wide variety of brands, although Christiania Bikes and Nihola have the largest market share by far. 14% were two wheelers - a style rapidly rising on the market here largely thanks to the Bullitt by Larry vs Harry, which made up over 30% of all the two wheelers. There are still a few trailers around - 4% of the total. In Copenhagen trailers are retro and remind us of Germans or Swedes in the 1980s. 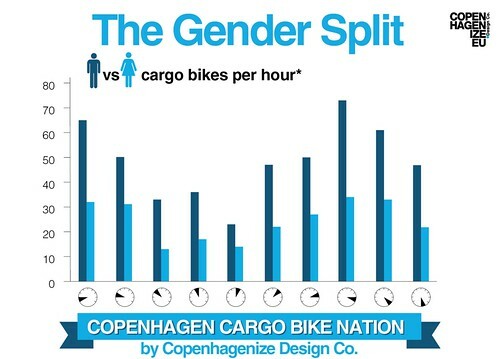 Men dominate the ridership of cargo bikes as you can see in the graph at bottom right, above. Ask anyone who sells cargo bikes in Copenhagen and they'll tell you that the woman decides the brand that the family will buy. In the neighbourhoods, this gender split is more equal. In the commuting equation, the balance shifts. Just out of interest we divided up the gender based on time of day, from 8AM to 6PM. Below is a large infographic if you fancy sharing it.